Because of Perl's focus on managing and mangling text, regular expressions are an integral part of the Perl language. RegexBuddy makes it very easy to use regular expressions in your Perl scripts. First, use RegexBuddy to define a regex or retrieve a regexp saved in a RegexBuddy library. Rely on RegexBuddy's clear regex analysis, which is constantly updated as you build the pattern, rather than dealing with the cryptic regex syntax on your own. Detailed help on that syntax is always only a click away. If you copied a regex written for another programming language, simply paste it into RegexBuddy, select the original language, and then convert the regex to the specific version of Perl you're using. If you're writing a Perl module that needs to work with multiple versions of Perl, compare your regex between those Perl versions to make sure it will work exactly the same with all of them. RegexBuddy knows exactly which regex features are available in Perl 5.8, 5.10, 5.12, 5.14, 5.16, 5.18, 5.20, 5.22, 5.24, 5.26, and 5.28. 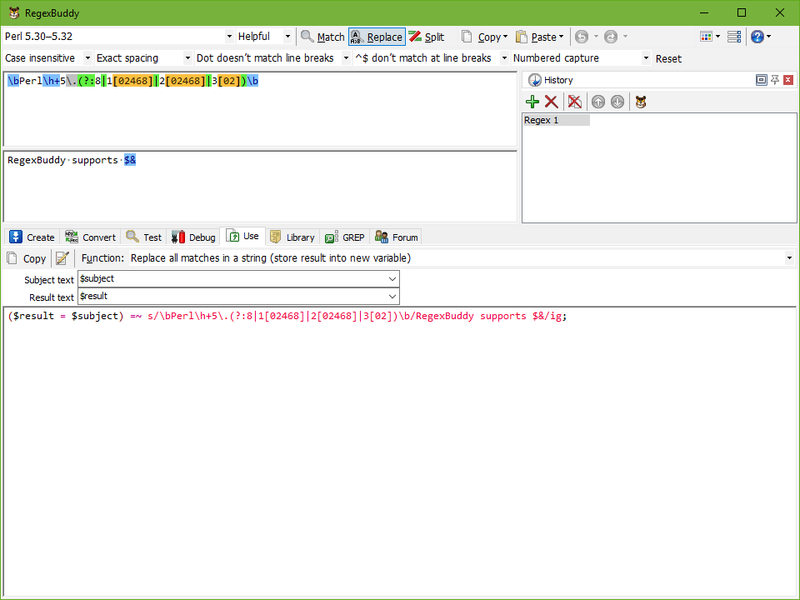 If you created a new regular expression, test and debug it in RegexBuddy before using it in your Perl source code. Test each regex in RegexBuddy's safe sandbox without risking precious data. Quickly apply the regex to a wide variety of input and sample data, without having to produce that input through your script. Finally, let RegexBuddy generate a source code snippet that you can copy and paste directly into whichever IDE or Perl code editor you use. Just choose what you want to use the regex for, and a fully functional code snippet is ready. You can change the names of variables and parameters to suit your naming style or the current situation, which RegexBuddy automatically remembers. Don't bother trying to remember Perl's specific regex syntax. And don't worry about properly escaping backslashes and other characters. Just tell RegexBuddy what you want to do, and you will get the proper Perl code straight away. Anything can be done: testing a string for a match, extracting search matches, validating input, search-and-replace, splitting a string, etc. Discover how you can automate tedious tasks with regular expressions. Find out how RegexBuddy makes the regex syntax crystal clear enabling you to use regular expressions with the greatest ease ever. Watch videos in your web browser and see what RegexBuddy can do for you. Buy RegexBuddy now and try it risk-free with our 3-month unconditional money-back guarantee. "I purchased RegexBuddy a year or so ago and I use it all the time with Perl. I just wanted to tell you that it's a very good product!" "I have been coding in Perl for years and had always found coding a new regex to be a tedious task. Not anymore! This product is downright awesome." Copyright © 2004-2019 Jan Goyvaerts.